Lichtenstein repair is generally accepted as a safe and widely practiced. Laparoscopic TEP herniorrhaphy is a recent technique and now increasing in number, but not generally accepted because of technical difficulties and not established peri-operative outcomes. This study compares perioperative outcomes and complications between open Lichtenstein repair and laparoscopic TEP repair. This study is retrospective study and from January to August, 2008, total 43 cases(22 cases of TEP method, 21 cases of Lichitenstein repair) were enrolled in this study. All cases were operated by same surgeon. Operative time, hospital stay, analgesic uses, post-operative hematoma, recurrence, groin pain, were compared. The mean operative time was 78 ¡¾ 20 minutes(min) in the TEP group and 72 ¡¾ 13 min in the Lichtenstein group and there was no statistical difference (p=0.223). The mean hospital stay was significantly shorter in the TEP group (4.5 ¡¾ 0.7 days) than in the Lichtenstein group (5.2 ¡¾ 0.8 days) (p=0.015). Total analgesic uses is comparative in both groups(1.2 ¡¾ 1.1 times in the TEP group and 1.8 ¡¾ 1.7 times in the Lichtenstein group). 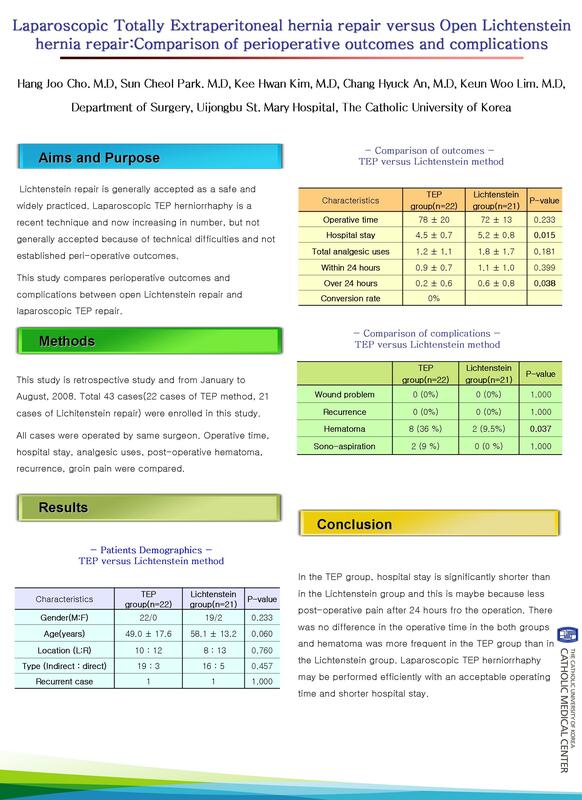 But, if result was stratified into two groups(within 24 hours and after 24 hours), analgesic uses is significantly frequent in the Lichtenstein group(0.3 ¡¾ 0.5 times) than in the TEP group(0.7 ¡¾ 0.8 times) after 24 hours (p=0.038). There was no recurrence in the both groups. Hematoma was more frequent in the TEP group (36%) than in the Lichtenstein group (9.5%) (p=0.037). But except for 2 cases of sono-guided aspiration in the TEP group, all hematoma patients were self regressed about after 2 months. Groin pain was comparative in the both group. In the TEP group, hospital stay is significantly shorter than in the Lichtenstein group and this is maybe because less post-operative pain after 24 hours from the operation. There was no difference in the operative time in the both groups and hematoma was more frequent in the TEP group than in the Lichtenstein group. Laparoscopic TEP herniorrhaphy may be performed efficiently with an acceptable operating time and shorter hospital stay.